A Vestil model HDD-60-7-P lift-and-dump hydraulic drum dumper. 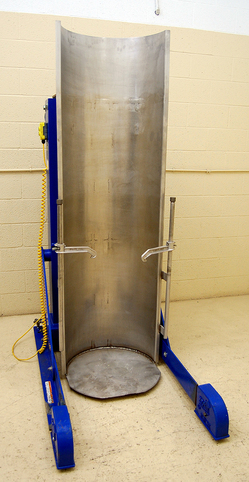 Stainless steel barrel holder chute 23.5 inches wide by 83 inches long, with hold-down clamps. Portable with fixed front casters, swivel rear casters, and floor screws. Manufacturer rated for 750lb capacity. 63.5 inch discharge height in full tilt position. 137" high overall height in full tilt position. 3/4 HP 110 volt single phase hydraulic power-pack with operator controls. Powder coated blue steel frame. As of this writing, this barrel dumper is in stock at Alard, in EXCELLENT operational, mechanical, hydraulic, electrical, and cosmetic condition, ready to go and available for immediate shipment. This page contains a single entry by Michael C. Shults, Alard Equipment Corp published on August 15, 2016 1:03 PM. 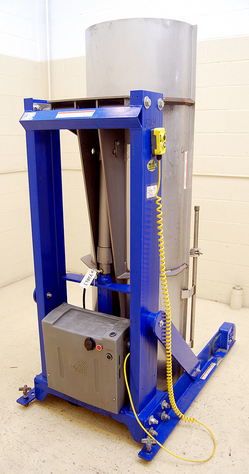 DEMO VIDEO METAL DETECTOR y1337 was the previous entry in this blog. Dixie Canner Model UD-AL CAN SEAMER, Y3047 is the next entry in this blog.